If you're interested in preserving your roots, family tree quilt patterns can help you create wall or bed coverings you'll be proud to pass down to your kids and grandchildren. Quilts that detail family history in a creative way also make great gifts for family members and friends. Sewing quilts that display family history is an old idea that lends itself well to new concepts and pattern modifications. In addition to traditional memory and family tree quilts memorializing births or other important events, quilters now have access to an exciting array of patterns and ideas for making keepsake quilts, family tree anniversary quilts, and family history photo quilts. Explore the vast assortment of options at your disposal before you make a firm commitment to one idea. 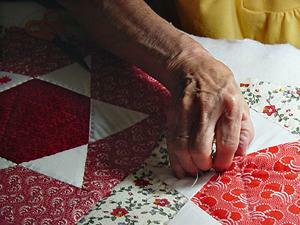 Needle crafts and sewing are more popular than ever, and quilting is no exception. Aside from the many pattern books on the market, the Internet is a great way to find the perfect pattern for your family tree quilt as well as assistance in choosing harmonious colors, interesting fabrics, and additional design elements. One of the best ways to find free family tree quilt patterns is by registering for Internet-based quilting communities and forums. In the spirit of sharing, members of these communities often provide online design tools, including free patterns, for just about any quilting project. Check out the quilting communities listed below. The Quilter Community doesn't require registration and offers resources like heirloom family quilt patterns free of charge. Whether you choose to register or simply browse the goodies, McCall's Quilting features a large selection of patterns easily adaptable to a family tree motif. The Quilting Forum provides little-known resources for memory quilt and family history patterns. If you're looking for something special but don't want to slog through hundreds of patterns, take a look at these listings, which feature family tree quilts of all styles, sizes, and skill levels. Some of the patterns listed here are for sale, while some are available free of charge. Christine Thresh's colorful family quilt pattern lets you display images of family members nestled among the tree's limbs. Learn how to combine quilting and appliqué with Secrets of Embroidery's family tree pattern. The purchase price includes 30 designs, detailed instructions, and two bitmap worksheets for convenience. June Tailor's free photo memory quilt pattern works well for family trees. The pdf includes images of the completed quilt, full quilting diagram, and detailed directions. If you prefer a more whimsical approach to family tree quilts, consider purchasing Victoriana Quilt Designs' pattern. Faces of family members appear inside the tree's many blooms. Quilting kits are perfect for people who love to create, but dislike the associated shopping and gathering. A good kit provides detailed patterns and instructions as well as most of the materials needed to finish the project. For more inspiration, take a look at the kits listed here. Family Tree Quilt: The finished product is a 29" X 29" quilt featuring a traditional tree with banners and ovals for dates and family member names. Quilt Addicts Family Tree: This kit comes in queen or double sizes and sports a Christmas tree style design with rectangles containing family names and dates. Finding well-written family tree quilt patterns is just the first step in the creation process. To make sure your quilting experience proceeds as easily and smoothly as possible, gather all of your materials before you start, work at your own pace, and most importantly, enjoy yourself!